Rabbit is a very charming animal. And we are one of those people who have fall in love with the rabbit. In many occasions, a rabbit becomes an inspiration in creativity, this jewelry collection is among those. Rabbit collection consists of 4 rabbits; namely, April, May, June and August. They are made of brass that have been coated using special technique. We hope that you may have found one of our rabbit in this collection charming and choose it to be at your side. This ring is a handcrafted , very unique. Hand painted piece by piece and High Gloss Enameling with detailed craftsmanship. 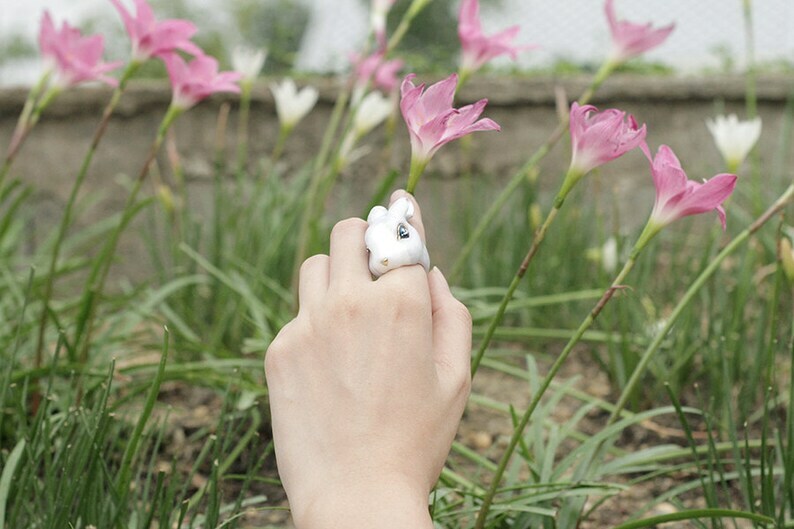 June , White Rabbit Ring , Animal ring, Statement ring. Chompoo Cat Earrings , Orange cat. Exquisite craftsmanship! This Blue Rabbit Ring is more beautiful in person. This is a Christmas present to myself. Thank you for the care in sending this remarkable ring to me. Elle est magnifique ! tout à fait conforme à la description, et même plus belle en vrai. L'emballage parfait et le délai de livraison a été beaucoup plus rapide que celui indiqué. Unicorn Ring Pink , Unicorn Ring . Originals. Chompoo Cat Ring , Orange cat.